Another fun collaboration with Shreebs Coffee went down in Culver city for NFL networks! We made about 600 coffees in 2 hours between the two companies! Shreebs Coffee will be opening up shop in the new year in Silverlake - so stay tuned and get some great coffee from them! I went to Colorado to visit my twin sister Jeannine. At one point she had a coffee cart as well, and quickly found her passion for honey. So she parlayed her coffee cart into a honey stand called I Love Honey. I made cold brew while she sold honey. It was a perfect match. We had an amazing trip in San Francisco for the West Coast Craft Fair at the Fort Mason Center. It is a design show featuring hundreds of selected designers, artists, and craftspeople. We must have made over 2,000 coffees in 2 days! 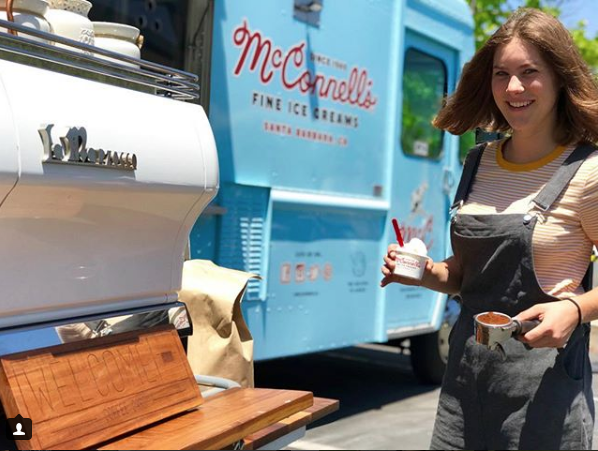 McConnell's Ice Cream is a legendary Santa Barbara company. They've been around for 70 years, through 3 generations, and now they have an ice cream truck. I love teaming up with other vendors, ESPECIALLY an ice cream one for affogatos. Coffee + Ice Cream = Magic in the mouth. Wylder Coffee Co and Welcome collabored in Ojai for a beautiful wedding at the famous Ojai Valley Inn. Wylder Coffee created a probiotic coffee that is straight up delicious and good for your gut that we served up to all the guests. We were honored to be a part of a fundraiser for African Women Rising. This organization works with over 8,000 women in Northern Uganda, training them in capital and savings, and adult literacy. We raise a few hundred dollars to give back to the organization. That's a lot of coffee! My girlfriend and I had the honor of making coffee for the first woman Iron Chef, Cat Cora and her new wife Nicole! We had so much fun showing off our delicious coffee and pastries from Deux Bakery. We popped up for Procore and busted out about 1000 coffees/day for a 3 day event for their engineers. Good thing we have a high volume machine - Thanks Fran! My life is all things coffee. When I'm not popping up with the coffee cart at events, I am training, practicing, researching, and delivering coffee. I work a lot with Dart Coffee Co., a local roaster, as their educator and as there random task person.